Vintage flattrack racing fiberglass motorcycle fuel tank part number VINFTD. Vintage fuel tank part #VINFTD is a center mount style vintage dirttrack tank. 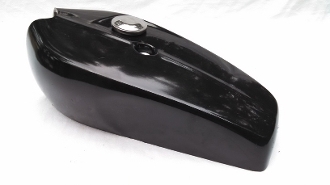 With a selection of tank bottoms available, this tank can be manufactured to fit bikes with a variety of different sized backbones. Width of forward area: 9.5"
Known applications: Trackmaster dirttrack frames. Triumph Pre OIF twins.